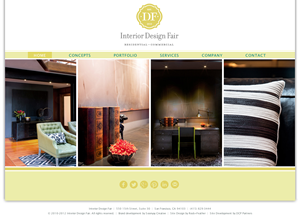 When Interior Design Fair decided to update their website from a static hard-coded site to a Content Management System, they turned to designer Nicole Bratt of Open Circle Creative and DCP Partners. Together we updated their internet presence and added a number of new features – including a custom Project Gallery, Concepts Gallery, and Team Member Gallery. There’s lots of custom AJAX-driven code, written as WordPress plugins, that provides exactly what the client wanted in functionality. With the new site, the IDF team can easily update their site without programmer intervention – allowing them to keep their clients and visitors updated with the latest information and improve their SEO ranking. Contact us for more information on this project and how we can help you take control of your site.